Numerous writers refer to the idea that medical institutions can be unfamiliar, forbidding places; that patients in them can feel alienated and acutely wrenched from their families. But what of those who care for the sick, the healthy who have to engage with the hospital and the illness as well? In the nineteenth century, for example, strict rules governed the visiting of patients. At the Hospital for Sick Children in London, unless infants were being breastfed, parents could only visit their children for an hour or so a week. how families and carers respond to these institutions. Work on the Hospital for Sick Children by Andrea Tanner suggests that carers – in this case mothers and fathers – could equally feel disoriented by being in hospitals. Studies of illness narratives regard the voices of the healthy as speaking as though they are on the outside looking in rather than experiencing the illness of their loved one with them. This impression is brought out in Marie’s account of travelling from Llantrisant to the Royal Orthopaedic Hospital in Birmingham for her husband’s biopsy. Where we might imagine it is her husband who feels frightened and alone, we hear how he moved beyond his “terror” into “state of reassured optimism”; “settled and relaxed” in his hospital room. From being strong and organised, Marie has a different response to the hospital. Writing about the family accommodation, Marie explains how she “felt like an imposter” and in various parts of the hospital how “I was inappropriately standing in their space”. As someone who is healthy, Marie felt alone in the world of the sick. Florence also feels this sense of the separation between the world of the sick and the world of the healthy in writing about going with her mother for a diagnosis. Florence very eloquently conjures up the experiences of the waiting room: “The people left in the waiting room were all silent, serious and keeping themselves to themselves. It wasn’t a place where people talk to each other as you didn’t know if you were someone awaiting bad news or if they were… Everyone left the waiting room very fast as soon as their loved one came out”. The silence here highlights how impossible it is for the healthy to speak: normal conversation is not possible because the voice of illness has taken over. However, this is not always the case. Writing about her nan’s final days at a community hospital, Sylvia explained how she and her family “stayed all night… talking about memories of our time with nana, laughing and crying.” Sylvia speaks positively about how “the room was filled with so much love I hope she felt it and it brought her some comfort.” In Sylvia’s account the healthy, and their voices, become part of the illness experience. This helps her to “accept and deal with” the illness of her close relative. These narratives say much about how families can feel isolated just as much as patients. Marie expresses this very clearly when she writes how she was “Displaced, unsettled and invisible”. 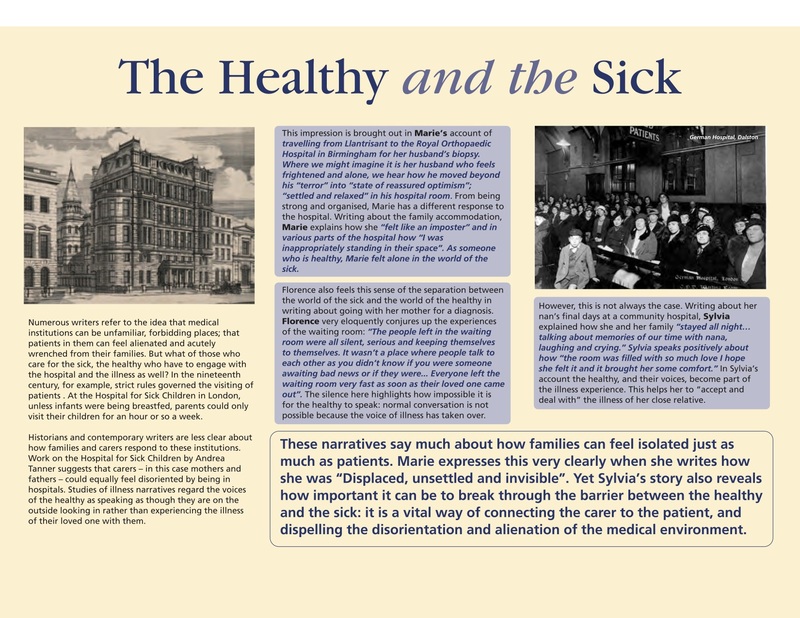 Yet Sylvia’s story also reveals how important it can be to break through the barrier between the healthy and the sick: it is a vital way of connecting the carer to the patient, and dispelling the disorientation and alienation of the medical environment.